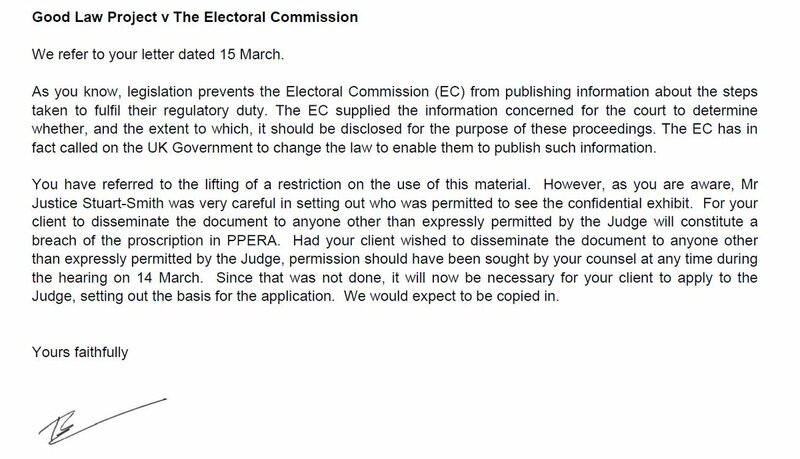 Thread by @JolyonMaugham: "So @GoodLawProject sued the Electoral Commission about its flawed investigation into whether (1) the DUP broke the law by accepting a “donat […]"
Part of the Electoral Commission’s defence included a Witness Statement attaching a secret exhibit that was (very unusually) sent to the Court but not to us. At the hearing we were allowed to see a copy of that secret exhibit, subject to accepting a duty to keep it confidential. Although the Electoral Commission continue to disagree, I have been advised by Queen’s Counsel that the confidentiality was discharged when that secret exhibit was discussed in open court. But it does contain this extraordinary statement at the end. Legally this statement is nonsense because there is no rule that because Vote Leave committed one offence it can’t commit another. But, worse, the EC says “therefore” it’s not in the public interest to investigate. So they *could be* aware of other offences Vote Leave committed – but which they don't think they can prosecute. It's worth standing back and remembering what @ElectoralCommUK - with the power of the State behind it - said to the BBC about @GoodLawProject's judicial review: that we are "fuel[ling] public mistrust where none is merited." 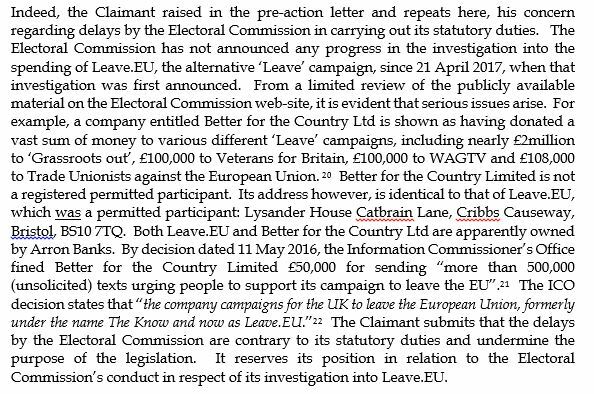 In summary, the Electoral Commission reckons – wrongly – there is a legal impediment to it finding Vote Leave committed further offences – and so has decided there is no public interest in investigating whether it did. First, those of us who have followed Facebook in the tax sphere experience it as viewing regulation as something to be followed in the letter but gamed in the spirit. Second, who amongst us believes Government is equipped to create a fit for purpose regulatory framework? And when it turns to Facebook - as it must - for help will Facebook act responsibly or maximise its regulatory space? 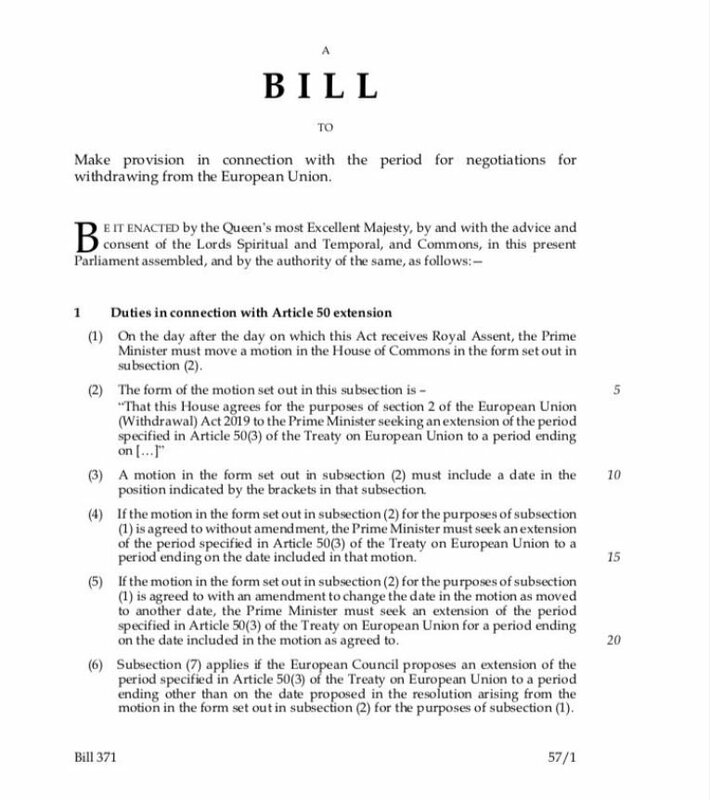 If Labour still wants Brexit, and to avoid tearing itself apart, it needs to take up with vigour the idea of Associate EU Citizenship for those who want it - and ensure it is part of the Political Declaration. The Treaties create a new legal order giving rights to the peoples - and not just the states - of Europe. The UK is not a monolith - and Associate EU Citizenship pulls from the wreckage of any Brexit something of inestimable value to those who choose to take it up. When first proposed, the idea foundered because of a lack of interest from our own Government; an ugly disdain of those who saw and see their personal identities inextricably bound up with Europe. The Cooper/Letwin Bill looks like a dangerous distraction. First, the timescale is too long. Second, it is too vague. Third, it doesn’t specify what happens if the EU proposes a different date. 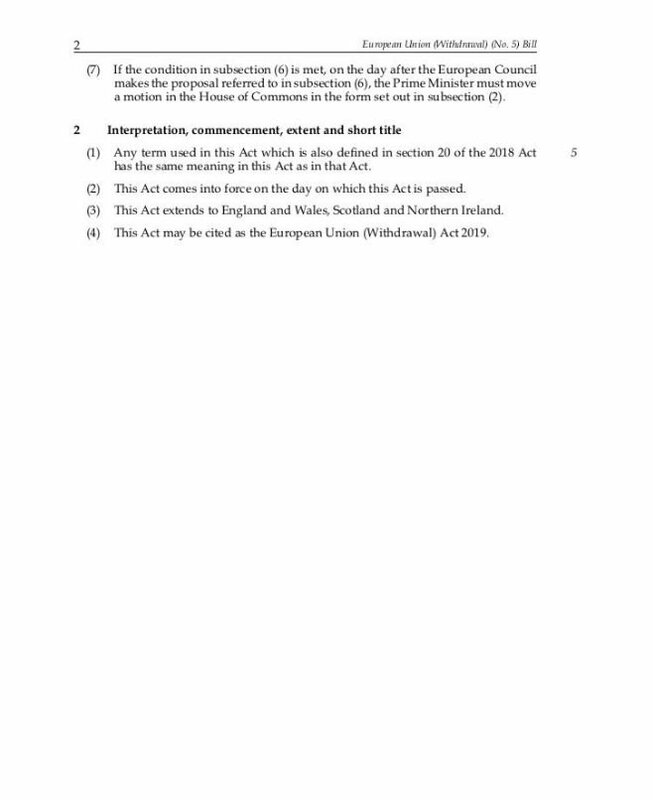 Fourth, it doesn’t specify what happens if the EU imposes conditions for an extension. Is this all really going to happen in nine days? (Apols the Y=2 should read Y+2). From the evidence we received, which has been supported by the findings of both the ICO and the Electoral Commission, it is clear that a porous relationship existed between Eldon Insurance and LeaveEU, with staff and data from one organisation augmenting the work of the other. We concur with the Electoral Commission that it is deeply regrettable that they are unable, by law, to tell Members of Parliament and the public about details surrounding the source of the £435,000 donation that was given by the Constitutional Research Council to the DUP. Arron Banks & Andy Wigmore showed complete disregard and disdain for the parliamentary process. It's evident that they gave misleading evidence about the working relationship between Eldon Insurance & LeaveEU They are individuals who have less than a passing regard for the truth. In that claim @GoodLawProject noted the failure of the Electoral Commission to make the relevant connections - see image. Better for the Country (Banks) funded this movie too: see image in previous tweet from the @GoodLawProject grounds of claim. 1.#Wyile testifies that #CambridgeAnalytica is a shell company owned by Robert #Mercer, #Mercer created #CambridgeAnalytica to provide cover for #SCL Group,its parent company and its operations. He describes #CambridgeAnalytica and #SCL group as Military Psy Ops. 2.#Wylie explains RIPON operation, RIPON used “data exhaust” to build psychological profiles in coordination with Cambridge University faculty. it creates modern day colonialism, harming fragile democracies, works illegally, without morals. Investigation says will focus on Better for the Country Limited and Banks, asking following questions: 1. Whether or not Better for the Country Limited was the true source of donations made to referendum campaigners in its name, or if it was acting as an agent. 2. Whether the recipients of its donations were given the information required by PPERA in respect of the donor.